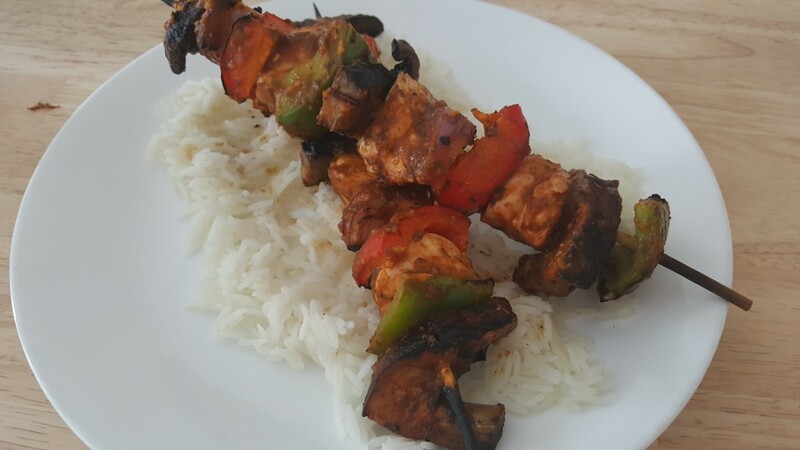 These barbecued chicken skewers are as hearty as they are tasty! They can be prepared well in advance so they're ready to throw on the barbecue as soon as you get home. Invite your younger cooks to help you skewer the chicken! Place the chicken in a bowl with the Barbeque Sauce to marinade for at least 15 minutes. You can have this prepared the night before or in the morning before cooking. When you're ready to start cooking, arrange all ingredients on the skewers. Line up all your ingredients and pierce the skewer through the middle. I like to alternate 1 piece of chicken to every two pieces of vegetable. Brush any leftover Barbeque Sauce over the vegetables, using more if necessary. Place the skewers on the barbeque and keep a close eye so they don’t burn. If they start to get too black, turn the heat down or move them off the direct flame to continue cooking until the chicken has no pink inside, about 5 minutes per side. Serve on a bed of rice with a side salad and enjoy! For a vegetarian option, omit the chicken and double the portobello mushrooms, or substitute the chicken for halloumi cheese!